The Siege of Leningrad was one of the key events of the twentieth century. In 1941, Hitler’s armies encircled Leningrad, confidently expecting to crush any resistance and enter the city. But Leningrad held out, in spite of almost unbelievable suffering. This novel focuses on the Levin family and their friends, trapped inside the besieged city. It’s a brilliantly imagined novel about war as experienced by ordinary people, and a profoundly moving celebration of love, life and survival. 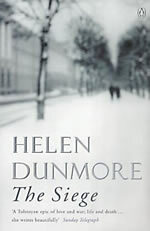 Shortlisted for the Whitbread Novel Award and for the Orange Prize for FictionThe Siege of Leningrad was one of the key events of the twentieth century. In 1941, Hitler’s armies encircled Leningrad, confidently expecting to crush any resistance and enter the city. But Leningrad held out, in spite of almost unbelievable suffering. This novel focuses on the Levin family and their friends, trapped inside the besieged city. It’s a brilliantly imagined novel about war as experienced by ordinary people, and a profoundly moving celebration of love, life and survival.